The Marilynn's Place Mardi Gras Bash is a day-long party taking place before, during, and after Shreveport's Krewe of Highland Parade. The event will include live music, food and drink specials, face painting and more. 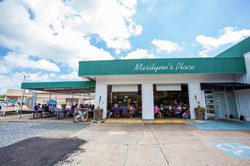 Marilynn's Place, a Cajun and Creole restaurant located in Shreveport, Louisiana, will host its 8th Annual Mardi Gras Bash on Sunday, March 3. The party will begin at 9 a.m. as the enormous parade stages in the neighborhood surrounding the restaurant. Marilynn’s Place, a popular Cajun and Creole restaurant located at 4041 Fern Avenue in Shreveport, will host the 8th Annual Mardi Gras Bash, 9 a.m.-10 p.m., on Sunday, March 3. The day-long party will include live music from Junior the Third, That Girl DJ, Easy Money, and Ouro Boar, as well as food and drink specials, face painting, and more. Party admission is free and open to all ages. VIP packages including reserved seating, table service and inside restroom access are available for purchase by visiting Marilynn’s Place or calling (318) 868-3004. Marilynn’s Place is located just one block from where the Krewe of Highland Parade XXIV will begin at the intersection of Gilbert Drive and Gregg Avenue. The party will begin at 9 a.m. as the enormous parade stages in the neighborhood surrounding the restaurant. The party will continue during and after the parade, with live music set to begin as the parade is winding down. Food specials offered at the party will include boiled crawfish, gumbo, beignets, meat pies and more. Cocktail and local beer specials will also be available throughout the day. Now in its 24th year, the annual Krewe of Highland Parade is a funky, unpredictable neighborhood parade that is typically made up of a combination of huge, colorful floats and quirky, homemade mini-floats, as well as numerous marching groups and bands. Among other things, the parade is known for its unusual “throws” – the items tossed by float riders and members of marching krewes – which have historically included grilled hot dogs, packaged ramen noodles and original works of art. Great places for visitors to watch the parade include the start of the parade near Marilynn’s Place, the west side of the Centenary College of Louisiana campus, the area near Columbia Park at 600 Columbia Street in Shreveport and the area near Noel Memorial United Methodist Church at 520 Herndon Street in Shreveport. For more information on Marilynn’s Place, visit http://www.Marilynns-Place.com or search for the restaurant on Facebook. For more information on Mardi Gras celebrations in Shreveport-Bossier, visit http://www.ShreveportMardiGras.com or call 800-551-8682.